When did the number of seat belts change in a 67? I have a 12D 67 SS350 vert and it has a 3909997 tire pressure sticker that says" 5 pass + 200lb luggage" and has an H in the bow tie. It only has 4 seat belts and I was wondering if a center rear seat belt was removed by the dealer or if it would have came with 4 from the factory. 67 RS/SS L48 4spd Conv. Since your 67's build date is 12D, & the service bulletin wasn't in effect until 2/14/67, I would assume your car came w/5 belts. 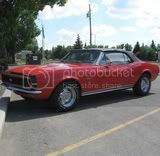 "Originally, the 1967 Camaro was labeled as a 5-passenger vehicle and 2 sets of front lap belts and 3 sets of rear seat lap belts were installed. Soon after the start of production, the rating was changed to a 4-passenger vehicle and only 2 sets of rear seat belts were installed for the remainder of the 1967 production." The way I read this, if your tire pressure decal says 5 passenger than it would have gotten 5 seat belts from the factory... since mine only had 4 seat belts and is rated as 5 pass, the 5th center seat belt would have been removed by the dealer. My car bas built at the end of Dec 66 and sold in March of 67, since the letter would have come in February it would make sence the center seat belt would have been removed. Now I need to find another 52-A-66 belt. Out of curriosity, approximately when did this change from 4 pass to 5 pass? For the 67 model year, appoximatley what month did this change from 5 pass to 4 pass? So it was changed at the factory at the same time as the letter went out... that makes sense. Thanks for the help. I will reply to your L48 thread as requested. Thought this was worth correcting. I have never seen a 67 with documented 3 belts. The label says 3, but they didn't install 3.